As a teacher I often chose to teach all year by taking part in the Summer Camp run by the school. The camp allowed parents that worked to have a safe, but enjoyable place for their children, and was an excellent source of extra income for the staff. For the older children, there were courses in photography, biking, art, and about any other subject a teacher had a yen to pass on. The younger children had themed play camps. The camps were great fun, one week was pirates, the next castles, even farming and space were included. The camp sang songs on the theme, we had art projects and activities, we dug for booty in the sand box, and in the afternoons, restful activities like napping. 3 to 5 year old children really can’t keep going “all day”. One favorite afternoon restful “activity” was simply reclining outside and looking at the clouds. Soon enough, those that were able to stay awake, were pointing out “oh look a duck, a dragon, a horse…look THERE!” It was enough to just keep them on the sleep mats we had pulled out side, and soon most of them were snoozing so as to be rested for late afternoon playground fun. As a teacher, it was often hard to stay awake myself. a singing cloud? or whistling? Someone asked me how I had “thought” of this terrific way to entertain children. I was shocked, surely everyone liked to look at clouds and pick out what they looked like. It’s got a fancy official name, pareidolia, but I considered it a wonderful way to sneak in some critical thinking. 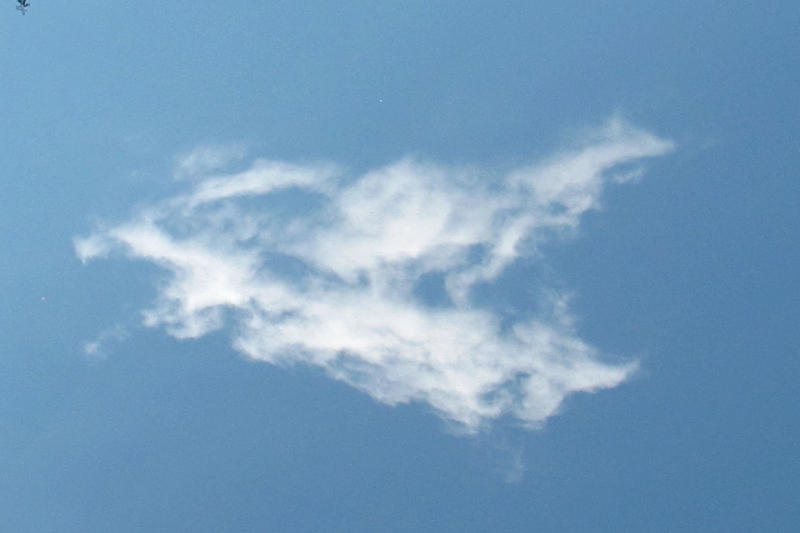 If a cloud can look like a dophin, then a tortilla that looks like the Virgin Mary is probably just a tortilla. Every child knows about pareidolia, that things just LOOK like other things, but they aren’t really the other thing. It’s sad that sometimes as adults they forget, and believe an object is whatever it is it slightly resembles. 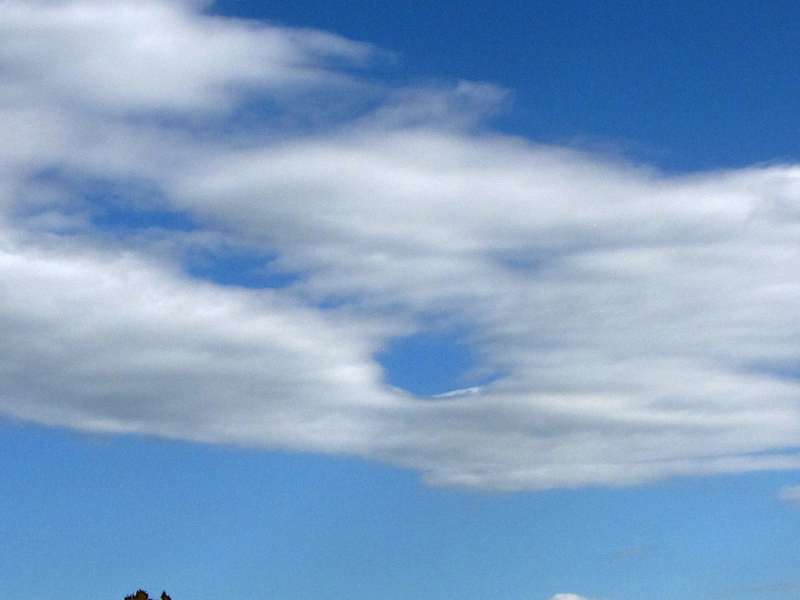 I found the cloud watching game great fun myself. People ask me how I can enjoy working with small children so much, and I usually reply by saying “I find something I enjoy that I can share with them!” I cloud watch even when I am not around small children. Here are some photographs from last summer. Whenever I am out on the boat (which is a very slow moving pontoon boat) I enjoy watching the loons that live on the lake and looking for interesting clouds. As people zip by on a jet ski they are having fun, but the loons don’t like them, and you miss out on a lot of other things, like clouds. 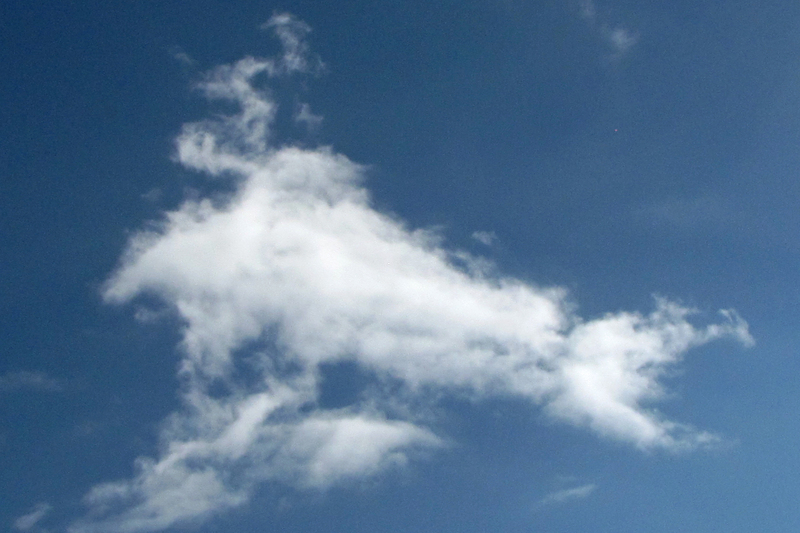 hmmmm, maybe a cave painting of horses, going in different directions? « Friday Fun Flick! Alien Hat Fun! Dictionary.com says that pareidolia is the imagined perception of a pattern or meaning where it does not actually exist, as in considering the moon to have human features. And Wikipedia says the word comes from the Greek words para (παρά, “beside, alongside, instead”) in this context meaning something faulty, wrong, instead of; and the noun eidōlon (εἴδωλον “image, form, shape”) the diminutive of eidos. Pareidolia is a type of apophenia, seeing patterns in random data. I’ve always found the word peculiar as it says “erroneous” and “imagined” when all that is really happening is that there is a universal law at work here – macro mirrors micro. So why invent a weird word like pareidolia when we already have the words in our lexicon to describe what is happening here? Humans often RECOGNIZE RESEMBLANCES and subsequently EXTRACT them from a MATRIX either by singling them out (pointing at them / framing them off / titling them) or adding elements that give the RESEMBLANCE a context along with a whole myriad of other EXTRACTION techniques. None of this is in error or imagined, these REPLICAS/SIMILARS are really there. As to why a RESEMBLANCE exists is like asking why we exist. Every answer is wrong and right – it is for the individual to decide. That means you can chalk it up to chance/random/statistical to divinely ordained/meant to be to a sign of intuition. BTW, this information was passed on to me by the Old Man in the Peanut – you will never look at a peanut the same!